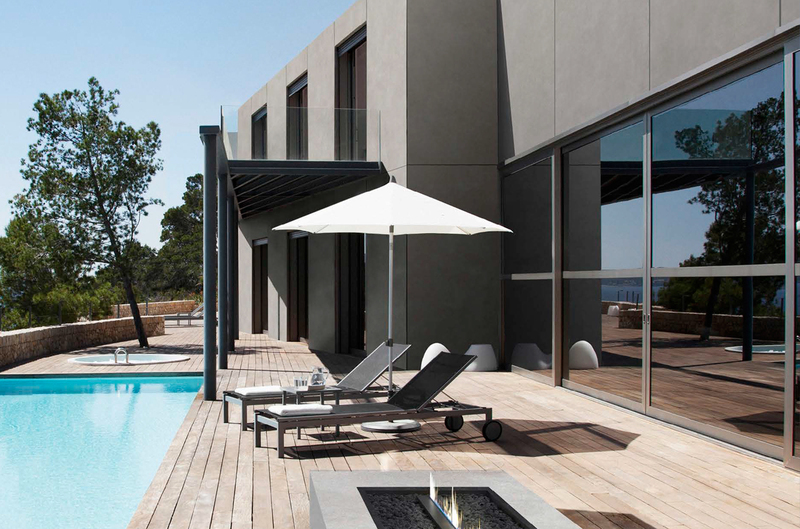 The Project Division of Infinity specialises in the design and consultancy for any type of architectural project. “Tailor-made” applications are fitted to the needs of customers, architects and industry professionals. Complete competency and in-depth experience is ensured by our experts who will always find concrete and punctual solutions for the project requirements and after-sales assistance. Would you like to know more about the Infinity products? Would you like to consult the Catalogue dedicated to the Project Division? 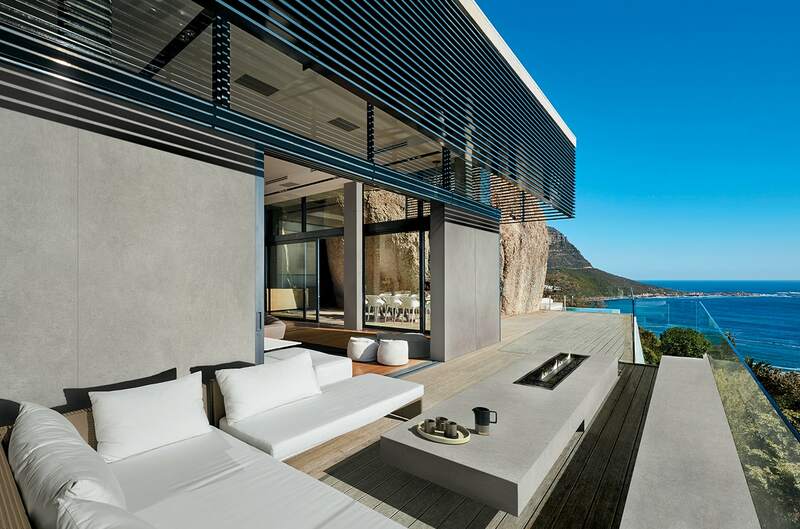 Infinity offers various ventilated façade systems. The professionals of the Project Division offer an in-house service of planning aimed at optimising the aesthetic choices in relation to the technical performance required. Ventilated façades are a highly sustainable system, aimed to increase the energy performance of buildings. The ventilated system works with the thermal insulation layers to minimise consumption linked to the cooling of interior areas, to improve indoor comfort, to disperse moisture from the walls behind and to protect them from bad weather. Would you like to know about all the advantages offered by porcelain stoneware? 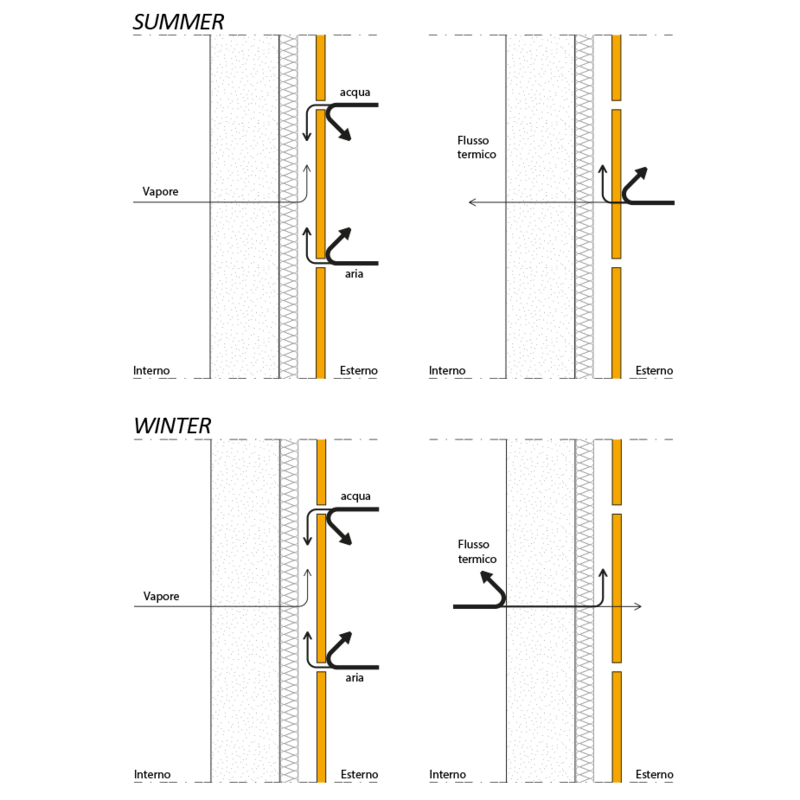 The UNI 11018 standards define the ventilated façade as a type of rain screen barrier where the cavity between the siding and the wall is designed in such a way that the air within it can flow naturally thanks to the principal called “chimney effect”, which notably improves the overall thermal-energy performance of the building. Would you like to know about Infinity’s commitment to the environment? 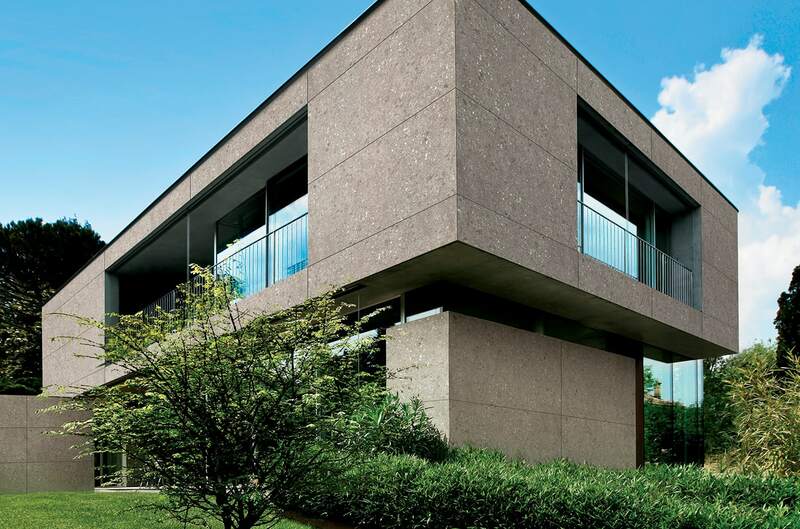 The 1600x3200mm Infinity slabs with 6mm thickness allow for the creation of ventilated façades with a huge reduction in the weight of the system. The reduced thickness of the slab is not suited to purely mechanical fixing, therefore the proposed systems use chemical adhesives to improve the wind resistance of the façade. Furthermore, mechanical safety brackets are always used in combination with this kind of anchorage. The chemical adhesives require a great deal of care in the application phase and, for this reason, the Infinity systems prefabricate this bonding phase at the manufacturing plant, checking that it meets all the application protocol standards. Using specific chemical adhesives, the Infinity slabs are pre-assembled onto aluminium profiles that have been specifically shaped to house concealed mechanical brackets and vertical supports that guarantee the safety of the system in all environmental conditions. The stoneware slab is pre-assembled by gluing and pressing it onto a panel made up with a modified polymer “core” and by a steel sheet. The final thickness of 18mm makes it suited to the construction of angular elements and monoliths for stunning architectural and aesthetic impact. The system is notable for its appealing aesthetics, achieved thanks to the ability of closing all the spaces between the Infinity slabs. The cladding panels are pre-assembled at the manufacturing plant onto an aluminium framework that increases their resistance and allows them to be fixed to the wall. Would you like to see the 6mm Infinity graphic designs available? Purely mechanical hanging systems can be adopted when using the Infinity slabs with a 12 mm thickness. These offer the best performance in terms of safety and durability of the façade. Infinity slabs are designed and drilled at the manufacturing plant using special cutters that generate slots on the back of the slabs, with conical section. The anchorage to the structure on site is done using inserts that expand within the slots but don’t generate any tension and stress within the body of the slab. This system is completely mechanical, which makes it easy to package and transport and, furthermore, guarantees the usual Infinity installation in any environmental situation. Would you like to see the 12mm Infinity graphic designs available? 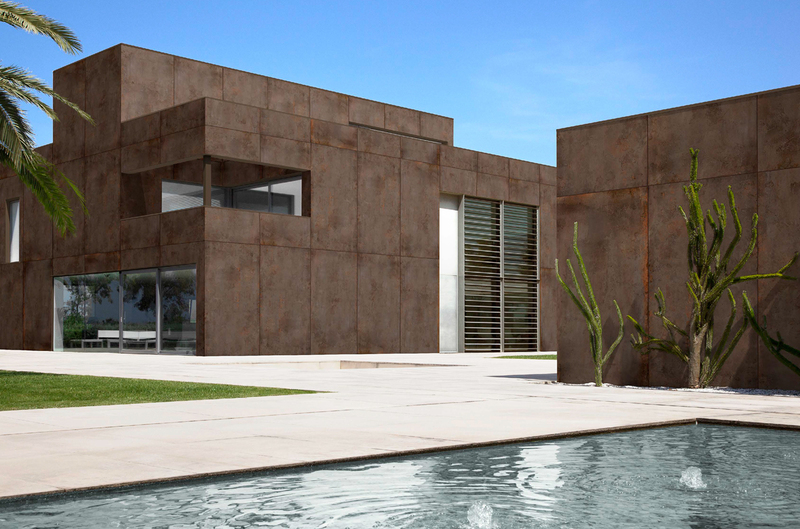 The use of ceramic materials directly onto the wall, both inside and outside is particularly common worldwide. Would you like to know about other applications for the Infinity slabs? Sub-sized Infinity slabs obtained by cutting (160×160 cm, 160×80 cm, 80×80 cm) can be supplied for specific projects with engineered finish. This finish allows the installation of our slabs onto a pre-existing floor or onto a levelled floor without the use of glue or sealant. Laying this type of new floor is exceptionally quick, immediately usable, non-invasive, reversible and reusable. It is particularly recommended for shops and all kinds of office types, but it is not recommended for use within residential settings or inside bathrooms. The use of technical raised floors is becoming increasingly widespread now that modern workplaces require flexible spaces with easy installation in terms of facilities. 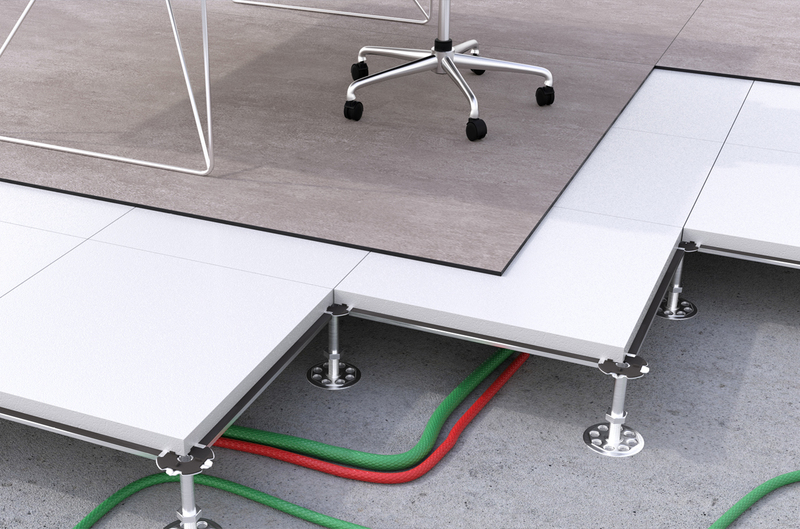 Thanks to the raised flooring system interior layout’s and predisposition of facilities can be reorganised according to contextual requirements and without limitations. Furthermore, all types of under floor maintenance are made easy. Infinity offers a solution that allows for installation of large-scale slabs even for this purpose, dividing the panel between its structural and finishing parts.